A Rathskeller is a German term for a bar below street level. The term originally was applied to restaurants that were located in the basement of city hall. The July to December 1907 Ice & Refrigeration Illustrated reported that Peter Fabacher & Bros. (Albert, John, Louis, Jacob and Peter) "fitted up a new rathskeller" and installed a new refrigeration machine furnished by the Cleveland Ice Machine Company from Cleveland, Ohio. The Fabacher family was well known in New Orleans through their restaurants. The Volume 29, Issue 1, 1911 Kappa Alpha Journal described "Fabacher's Bohemian restaurants as being known to "Theatrical people throughout the country" and the Rathskeller as being conservative and "quietly elaborate." Peter, the president and general manager of Peter Fabacher and Bros. Catering Company, was a German immigrant born in 1869. He had a brewing background. His brother, Lawrence Fabacher, founded the Jackson Brewing Co., best-known for producing Jax Beer. German emigrant and former Fargo brewer, Thomas Erdel, opened a saloon named the Rathskeller Over the Rhine in Moorehead, Minnesota during the 1890s catering to an "elite clientele." It offered European beer and old style German lunches. A "little German band" played nightly from its open air veranda. The saloon and café was located at 1st Street and 2nd Avenue North, and extended over the Red River. It has been noted that the saloon contained an escape tunnel for customers to use if and when necessary. It was considered "one of Moorhead's leading saloons." 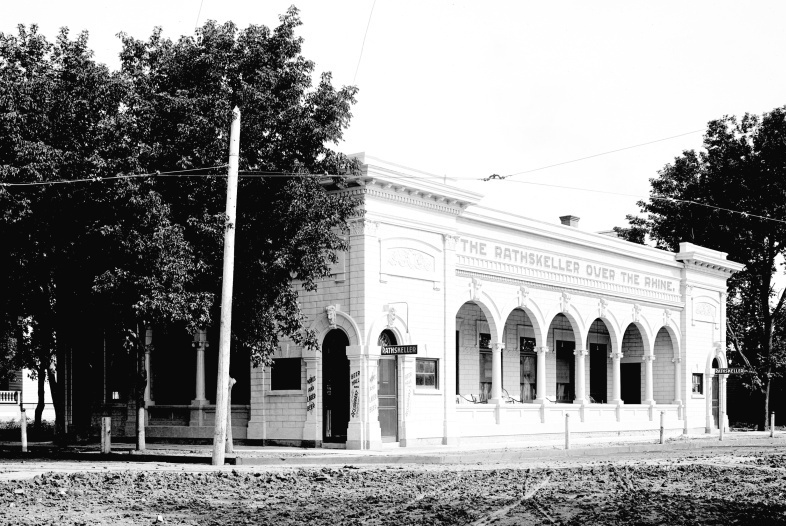 The Rathskeller closed shortly after Prohibition won out in Minnesota on May 17, 1915. The January 9, 1918 New Ulm Review later reported that it was being remodeled into an apartment house. The Rathskeller Over the Rhine in Moorhead, MN. The building was torn down during the 1960s. Albert M. Heinl was listed as a saloon keeper in Lexington, Kentucky in the 1898-1899 Lexington City Directory, and again in the 1900 Federal Census. He was married to Miss Gussie Klair on May 18, 1887 and referred to as a "saloon-keeper" as early as 1896. He did business as A.M. Heinl & Co. and partnered with Ed Lauck. They were advertised as a saloon and dealers in choice wines, liquors and cigars. A rather peculiar incident was reported in the October 28, 1896 edition of The Climax when Heinl cut the heads off three large turtles and threw them in his back yard. Later that afternoon, a dog was seen in the vicinity with a turtles head fastened to his leg with such force it broke. It took half an hour to pry the turtles head off the dog. Heinl died at 41 years of age on October 21, 1908. The Marlborough Rathskeller, which operated inside the Marlborough Hotel, was located on Broadway at 36 & 37 Streets at Herald Square in New York City. The impressive six-story Victorian brick hotel opened in 1888. In 1908, the famous magician, Harry Houdini, and several other famous magicians of the time, are known to have performed at the hotel during the Fourth Annual Dinner of the Society of American Magicians. The hotel and its Rathskeller closed soon after Prohibition was enacted in 1920. John P. Kleman was born in Pennsylvania in 1862. The 1900 census lists him as a "saloon owner." 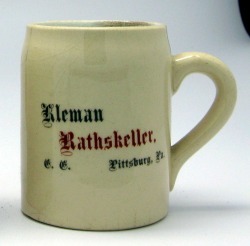 He owned and operated Kleman's Rathskeller in Pittsburgh at Penn and Collins Avenue during the early 1900s. He and his sister Anna C. Kleman lived on Frankstown Avenue in Ward 19, Allegheny County, Pittsburg, PA. The 1910 census lists John as being self employed as a hotel keeper operating the Midland Hotel. In the March 13, 1912 Forest Republican, it was reported that a death occurred in a "Cheap Hotel." It was in reference to the Kleman Hotel further described as an "obscure hostelry." It is unknown if John Kleman was the operator. At a later date, another reference to John Kleman appeared in the 1926 Jewish Criterion which reported that J.P. Kleman, "for many years, one of Pittsburgh's leading restaurateurs, took over the former Negri Inn upgrading and renaming it Kleman's Inn.